"He has stood in the midst of persecution and adversity. He has never lost his love and faith in God and his fellow man. God has inspired Rev. Moon to bring a message of hope, direction and empowerment for today’s family." "The program promises to be an evening of upliftment, joy and satisfaction with a new vision on how to stand together and work for the sake of renewing our communities and nation. It will be an evening of reconciliation, repentance and prayer." Sun Myung Moon today seems more bent upon his quest to recasting himself in global public opinion than ever. As J. Isamu Yamamoto put it well in the mid-1990's: "Like any man in his late 70s who has tons of cash to throw away, who is obsessed with how people perceive him, and who still yearns to fulfill the glorious dreams of his youth, he is trying to purchase an exceedingly expensive face-lift. He wants to appear more culturally relevant and less religiously arcane by transforming the image of his movement from a church-oriented crusade into a family-affirming organization" (1). Unificationism has long hidden behind the veneer of respectability that its support of academic, political, industrial and conservative front groups has provided for it. But Moon's self-imposed mission of ecumenically-oriented values crusading has been openly seeking for years to create a base of interracial and interfaith support for his real agenda, the advancement of his antichristian Unification platform. This is perhaps the most disturbing development in the Unification Church's ambitious efforts in recent years. In the Christian community, Unificationism has been actively making great strides in persuading Christian leaders in minorities that they have a common cause, and that partnering with them to foster a spiritual environment of change is necessary to save, if not America, then at least their local communities of faith. Convinced his failure to become a major religious figure of international prominence while operating from a base in the United States has been because of white American prejudice against non-white foreigners with radical religious views, Moon has used the race card well in his efforts, citing racial bias as one of his great problems with Christian leaders today (note the ad blurb above citing the "persecution" he has withstood) and not the plain fact that his doctrine is heretically polarizing and dangerously cultic. 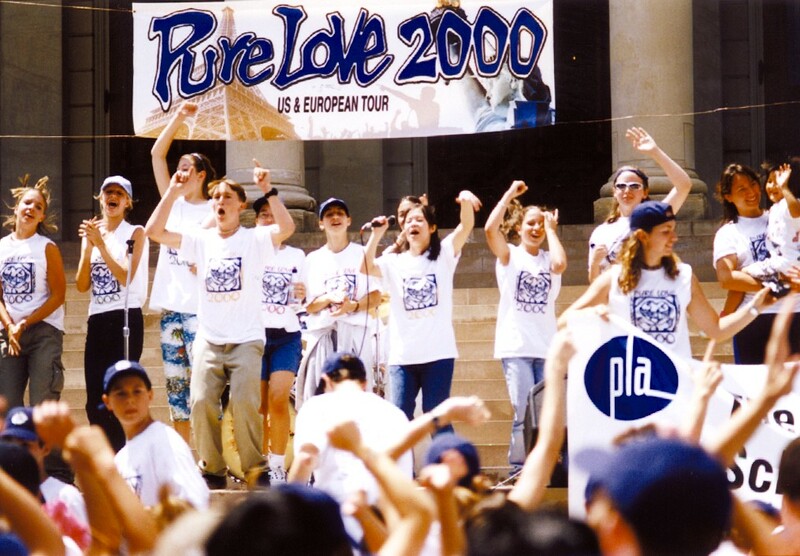 He has downplayed his claim to being the Messiah, and reinvented himself as a pro-family moral crusader in the business of "empowering" the family today (the picture here is of a "Pure Love" rally in Lansing, Michigan in 2000). In so doing, he has targeted African-American pastors and church organizations quite extensively, while simultaneously making interfaith development of social service projects focused on youth problems a top priority (such as abstinence and peer-group counseling programs among inner-city minority kids). And it has been succeeding since the program emphases undeniably have attracted minority Christian leaders by nominally touching upon three major issues that they have great concern over, namely antidrug, profamily, and interracial cooperative initiatives. While many politicians watch from afar off, increasing numbers of local, state and city leaders are stepping forward to embrace Moon's work - and curry a favor or two (not unlike the example of 1970's political leaders who lauded the "Reverend" Jim Jones and the People's Temple before their exodus into Guyana). A report in Moon's Washington Times, Farrakhan had indicated that "what I want on that Mall on that day is to give the world a taste of what the kingdom of God looks like when people of all races, hues and colors . 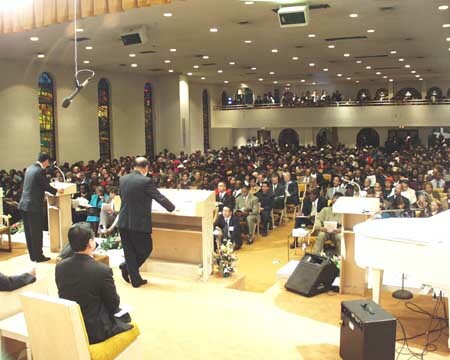 . . can relate to each other as God intended," and that "in recent years, Unification Church officials have attended Saviour's Day celebrations, the Nation of Islam's annual gathering in Chicago. Meanwhile, Farrakhan appeared at a Unification Church marriage ceremony at Robert F. Kennedy Memorial Stadium in the District in 1997. Farrakhan also has traveled to South Korea, where he and his delegation visited a university and other institutions founded by the church (3)." Given what we know about the centrality of the True Father's "blessing" given over marrying couples in Unification doctrine, and that only truly "blessed couples" can enter the "kingdom of God", it is not at all reasonable to assert that Moon's practical, if not doctrinal, influence was at work when Farrakhan called those 10,000 couples together, even if the vast majority of them were already married. Moon, who was at that time in the Marshall Islands as guests of the government, certainly had to be quite satisfied to see this come to pass, and certainly viewed this as an act of national salvation. But Moon's plan to "save America" has always been part of his self-appointed scheme to save the world, and to that end, his efforts to gain national prominence and influence began ever since he arrived here. He hit the ground running in the early 1970's through his fledgling Unification Church in a nationwide grassroots campaign energized by zealous recruits that sought to support the crumbling decay of the Nixon administration shortly before the disgraced president abruptly resigned. But the energy and passion of Moon's workers left an impression on the Republican activist establishment there. Despite national reports of abusive recruitment and unethical fund-raising tactics, as well as some embarassing moments a Congressional investigation probing his links to the South Korean intelligence community in Washington later that decade, Moon would arise to become a figure of great influence there, and is now a fixture in the power-brokering underbelly of the Capitol. What was his secret? It was a simple truth: money talks, and the more you have of it, the louder and more persuasive it can be. His organizational checkbook seems to have pockets of unlimited depth, and all of his front groups have shrewdly known where to spread it around across the United States and the rest of the world. This has been the biggest means of providing attention to Moon and to help him gain an audience for his unbiblical ideology. His longstanding courting of the conservative community, from evangelicals to politicians, as well as his attempts to use entertainment figures to raise consciousness of his activities has resulted in dubious commendations by various Christian, Jewish and Muslim leaders across America, many of whom have been recipients of Moon's hospitality at all-expenses paid junkets around the world and who have come together as an ad hoc committee of pro-Unificationism. 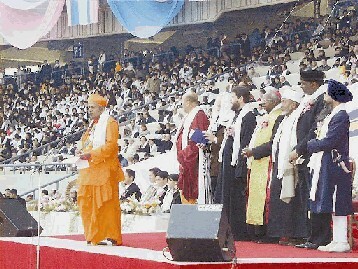 The caption of this photograph, of the "Blessing" held in South Korea, in February, 1999 shows just a few of them: "Pastor T. L. Barrett, Archbishop Emmanuel Milingo, Rabbi Herzel Kranz, Sheik Alamin Osman, and other religious leaders pray for the newly married couples at Blessing '99 in Seoul Korea, February 7, 1999." Ideological unity seems less the draw than do the kinds of material and monetary gifting Moon's organizations have bestowed upon many of these same people. Not a few of them now stand shoulder to shoulder with Moon as he travels across the nation, and have used their own personal influence and contacts to fill churches and convention halls in the name of "unity" and brotherhood. Reverend McAfee - whose church hosted Moon's visit to Minnesota - attempts to be fair and open-minded about Moon's theology here, but instead demonstrates one of the most fundamental and common errors many people have when attempting to discern between truth and error: they display a fatally flawed naivete in their dialogue by believing that deceptive people will not misrepresent themselves! Since the Unificationists said they didn't believe what McAfee had been told they did, then they could be counted upon to speak truthfully for themselves. His attitude strongly implies that he could best understand Moon by allowing him to take his pulpit and speak for himself before a captive audience! It assumes that Moon, in good faith, would speak truthfully and forthrightly about his doctrinal distinctives, and that is something that he simply has never done before non-Unification audiences. It may be argued that he may be sincere in his beliefs, but a counterargument responds that if he is sincere, he is sincerely wrong. Sincerity in one's heart and soul never guarantees truth is in one's mind and speech. This reminds us of the little old lady who scolded her pastor for calling the Mormon Church a cultic group since two of their missionaries she asked about it firmly denied that they were! Such a blind acceptance of someone's claims without any objective appraisal that gives them the opportunity to spread them even further is definitely irresponsible at best, and a potential sellout to Satan at worst. Plenty of other sources of information issued directly from Unificationists exist on the Internet, in publications and religious reference books: McAfee (or anyone else) doesn't need to host a church meeting for his flock to receive indoctrination from Moon to hear him out. Such an attitude is absolutely shocking in its total lack of consideration for the spiritual welfare and defense of the Christian congregations who likely know no better. The shocking part of this is that Reverend McAfee - and so many other Christian ministers - are so freely lending to Moon the kind of spiritual and teaching authority a Christian minister would have in the pulpit over Christian congregations! This is an act that will clearly put many a believer into spiritual jeopardy as Moon's talk drones on with his basic exposition of Unification doctrine dressed in Christian garb, a doctrine virtually invisible to Christians who simply take what someone in the pulpit says at face value as spiritual truth straight from God! This sad turn of events had heartened many a "Moonie" across the nation, and we quote one of the many exultant e-mailings that Unificationists are now circulating, with our emphases: this one refers to the first meeting of Moon's tour held at a large Church of God in Christ in New York City on February 25.
attendance, at the Garden of Prayer Cathedral in Bronx, NY. TPs (True Parents) were so happy. The HOLY SPIRIT was so powerfully present with Ministers and attendees bouncing and jumping as they sang and praised God, the Holy Spirit, Jesus AND Sun Myung Moon. ... TF first asked the crowd whether he was handsome or ugly? He warmed everyone with beaming smiles as he shared from his heart for about 15 minutes before reading his speech. His speech was very powerful and I am sure confronting for many. A second speech was later read by an elegant speaking minister. Both speeches combined effectively taught all of DP (Divine Principle) in a condensed, to the point manner. It was beautiful having the kickoff event in this cathedral of Bronx, NY because the building and surrounding city was more grassroots America then events we have often had in plush hotels. The feeling was more of TF speaking to us in the garage of Belvedere. It was like Jesus holding a townhall meeting. ... I have so longed for a Messiah of this type ..... going to the grassroots. Many ministers pledged determination to follow with the tour and take up the crusade to save the "family" and build "True Families". Praise God ..... Look Out Satan ...... TF is on the move. (6). Take heed that no man deceive you. For many shall come in my name, saying, I am Christ; and shall deceive many. ... Then if any man shall say unto you, Lo, here is Christ, or there; believe it not. For there shall arise false Christs, and false prophets, and shall shew great signs and wonders; insomuch that, if it were possible, they shall deceive the very elect. Behold, I have told you before. And time fails us to discuss Moon's many other widespread activities such as his new ventures in South America, his disruptive presence in the former Soviet republics that has contributed to the explosive growth of cults there, nor his imprisonment for several years of intentional tax evasion in the mid-1980's. But one thing is for certain: a "new" Moon is arising over the religious landscape again and thousands of Christians have come under his sphere of influence once again, but this time in ways scarcely imaginable only a few years ago. Who could ever have foreseen the depth of Moon's power brokering in Latin America and his connections to the Bush political dynasty - years before the 2000 elections? Who could believe that Bible-believing Christians supposedly able to discern between the true and the false could so pliably bend to Moon's will and sing in choirs at his "Blessing" mass-weddings or offer up their pulpits and reputations to further his own agenda? These developments are literally breath-taking, that is to say, they knock the wind out of one's spiritual lungs in utter shock at the brazen apostasy that is displayed in these extraordinary events. 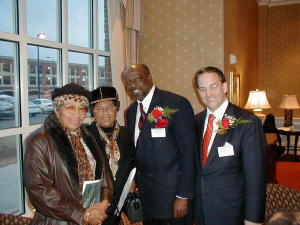 Perhaps Moon's most incredible public relations coup of late was his Washington Times Foundation on January 19, 2001 sponsored "an overflowing interracial and interfaith inaugural prayer luncheon" that brought together over "1,700 religious and political figures" before President George W. Bush's inauguration. During the event, Moon was given an award - as well as one given to honor evangelist Billy Graham (who did not attend) and the late Dr. Martin Luther King - to the applause of Christian leaders like Pat Robertson, Paul Crouch, Kenneth Copeland, Tony Evans, Robert Schuller, Jerry Falwell and the president of the Southern Baptist Convention, James Merritt. Even attorney general John Ashcroft stopped in. It speaks volumes about the willingness of Christian leaders to bow to the gods of social expediency and politicking or at very best, their unbelievably lax discernment in failing to recognize who was picking up their tab at the luncheon. Firmly be convinced that Christians have no business joining spiritual ties with Sun Myung Moon or his many front group organizations. We believe we have presented enough evidence to demonstrate that Moon is no Christian minister or visionary but is an antichrist whom Scripture commands us to resist and not support. Scripture commands in 2 Corinthians 6:14 to "be ye not unequally yoked together with unbelievers: for what fellowship hath righteousness with unrighteousness? and what communion hath light with darkness?" We are not to interact in Christian brotherhood on a spiritual basis with Unificationism which so deeply rejects Christ as Lord and Savior, views only the "True Family" as the Kingdom of heaven on earth, and demands the subjugation and control of the world under Moon's less than capable hands. Also be convinced that we are called to oppose spiritual apostacy and darkness. We are to be the "light of the world," as Jesus enjoins us to in Matthew 5:14. In fact, we are called to "have no fellowship with the unfruitful works of darkness, but rather, to reprove them" (Ephesians 5:11). Reproval doesn't mean we should be red-faced and obnoxious about our responses - it commands us to "earnestly contend for the faith" (Jude 3) by "speaking the truth in love" Ephesians 4:15. The truth about Moon and Unificationism's deceptive nature must be spread abroad. Christians as well as non-Christians, Gentiles and Jews, blacks and whites, Democrats and Republican should be well-informed about Moon's agenda, and not supplied a cloak of respectability by them. Know what you believe and how what Unificationism teaches opposes it - Christians have no excuse, in our information saturated age, to not know what the differences are between Christianity and the cults that pervert it. The differences still matter. Doctrine alone are not the only beliefs Christians differ with Unificationism - it's deceptive nature and abusive past defy Biblical demands for honesty, integrity and true compassion. Political correctness and postmodern perspectives have dulled many a Christian eye to the need for Biblical discernment, but in fact, the mark of spiritual maturity is to be discerning (Hebrews 5:14). Moon's works, when discerned, are found to be riddled with errors. Many fine resources exist to find out what these are. Perhaps the best Christian teaching resource at hand today is the Zondervan Guide to Cults and Religious Movements issue on the Unification Church authored by Jerry Yamamoto. It should be required reading that will help define the differences clearly and concisely. Spread the alarm and get pastors and ministerial associations informed, if not involved - The Christian Church is threatened daily by sects within and without it, and busy pastors and ministerial associations, which typically focus narrowly upon their shepherding duties and responsibilities (preaching, pastoral care, visitation and counseling) may often be completely unaware of any of the dire threat that counterfeit spirituality poses as it seeks to infiltrate into the church. Christians must raise the issue intentionally, deliberately and frequently with Christian leaders to keep them aware of the issue. Some may try to duck or downplay the issue, but without being argumentative and polarizing, gently but firmly exhort them to reconsider their positions and keep pressing home the need to "defend the faith." You may need to prepare yourself for some of the most incredible and hostile displays of intolerance by Christians concerning your own "intolerant" position on Moon! Witnessing to Unification members must be viewed as vital and NOT futile - Even the heretic, the Scripture says, deserves a couple of chances. 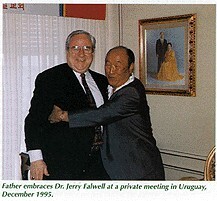 Christians should be unafraid of sharing their faith with a Unificationist and then contrasting it with the unbiblical claims of Sun Myung Moon in a loving, patient manner. Unificationists should be lovingly confronted with the claims of their Master (most importantly, that he is the Messiah), the twisting of the Bible to provide justification for their false doctrine, and a history lesson on Moon's past and Unification Church abuses of its members. The power of the Holy Spirit has been given for us to do just that (Acts 1:8), and discussion to these ends is a New Testament pattern (Steven's sermon in the book of Acts is one fine example) but the Gospel of Jesus is the only thing that will change any of them (Romans 1:16). Without anyone to proclaim these things to them or any other lost group of people, however, will not show where they are going astray. Christians must make the effort to reach out to Unificationists and show by their example that Jesus truly is the center of our joy, our salvation, and that His love for us surpasses anything their organization will ever show them! In closing, we earnestly implore all Christians in the name of our Lord Jesus Christ who may be lending their time, money and energy to Moon's front groups and ecumenical efforts to immediately cease and desist! It is time that Christians once again stand for the honor and glorification of Jesus Christ alone, and not any aging Korean man claiming to be the new Christ. Your Lord is watching, as well as the whole world. Will you stand for the Truth (John 14:6) or fall for a liar (1 John 2:18)?
" .. I received a letter which was a dimly veiled threat, and then two phone calls, very specific, that I had better be careful what I say tonight.Well, I am very careful of what I say. And very carefully I say it. I hold this movement to evil and dangerous. 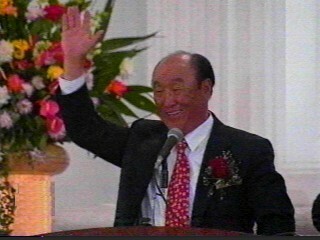 I hold Reverend Sun Myung Moon to be a charlatan and a manipulator of people. I hold his inner henchmen to be devious, unscrupulous and false. And I hold the kids that are caught up in this to be the innocent victims of their own weaknesses, the innocent victims of their own dreams, the innocent victims of their own needs. But most of all, the innocent victims of Reverend Moon.Now, I cannot say it any more carefully than that." (2) http://unification.net/ucdc/ucdc20001105.html - The hyperlink in this quotation will go to the online version of the Nation of Islam's newspaper, The Final Call. 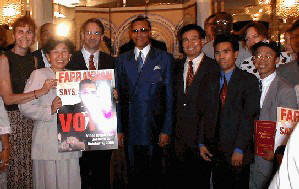 Archived there is a Real Video presentation of the actual press conference Farrakhan held on October 23, 2000 - after the Million Family March. Farrakhan lavishly praised Moon and the Unification movement's massive amount of involvement, freely admitting to having received his inspiration for the Wedding Blessing from his contact with Moon, (this may be heard toward the end of the clip at around the one hour mark). Rev. Charles Williams of Little Rock is helping both in Texas and doing the same thing with Rev. Bruce Biggins in Arkansas. They are bringing in all the pastors in the city together. They have secured the renowned and award winning Mississippi Mass Choir. Dr. Williams brought 12,000 last year to a gospel fest. Don't be afraid. Be wise and pray. If your pastors have strong inspiration they will break through. After we reported this to Father he said, "The Time Has Come." ... In Boston they are giving the Young Heroes Awards to 100 youth and they are inviting all the church leaders to support this effort. Last year they brought a tremendous result. Reach out to all churches, political leaders, media, academic and community leaders. ... WFWP Chairwoman Alexa Ward is heading up our nationwide VIP outreach with a special focus on Catholic Cardinals and Bishops and Bishops of Lutheran, Presbyterian, Methodist and Episcopalian churches. Mrs. Wendy Herstein and Mrs. Robin Musiol are heading up Evangelical Christian Outreach to top nationally famous leaders. ... Acquiring a famous Gospel artist can bring a huge result. Ask the pastors on your invitational committee who can draw the Christian community. Through the pastors you can find out who is most popular with the church leaders. The Gospel artist can range anywhere from $1000 to $15,000 dollars. However, if they become inspired through the testimony of the clergy they can drop their requirements to a very small amount. For a really powerful draw and famous artist expect to pay $5000 - $7500.